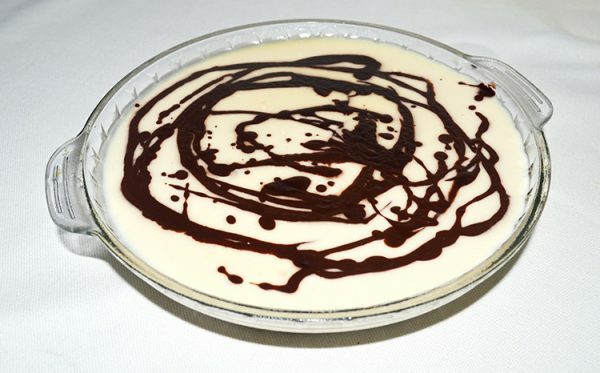 A delicious soft cream cheese set dessert with coconut and chocolate flavours. Add the evaporated milk, coconut milk, fresh milk, sugar, and agar-agar powder to a pan and mix well. Divide the mixture into two portions: ¾ and ¼ . In the ¼ portion, add cocoa powder, and in the other add cream cheese. Boil each portion separately in a pan until the mixture becomes thick. Take a dish and pour the larger cream cheese portion into the dish. Then add the cocoa mixture portion in to the same dish forming a design of your choice. Place the Cream Cheese Delight in the fridge to set for a few hours. Once set, it is ready to serve.